Tombstones Modern Machine Shop 71 platters enabling the HMC to do five-sided machining. The machine's three linear axes can combine with the coordinated rotary indexing motion of the platters and the rotary motion of the machine's worktable to reach five sides of each workpiece on the face of the tomb- stone—and do some operations with all five axes moving at once (of course, the orientation of the cutting tool in the horizontal spindle cannot be programmed, so this is not five-axis machin- ing for contours or sculptured surfaces). 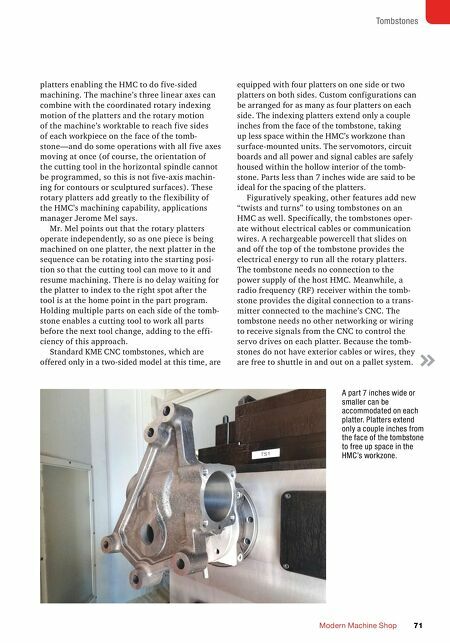 These rotary platters add greatly to the f lexibility of the HMC's machining capability, applications manager Jerome Mel says. Mr. Mel points out that the rotary platters operate independently, so as one piece is being machined on one platter, the next platter in the sequence can be rotating into the starting posi- tion so that the cutting tool can move to it and resume machining. There is no delay waiting for the platter to index to the right spot after the tool is at the home point in the part program. Holding multiple parts on each side of the tomb- stone enables a cutting tool to work all parts before the next tool change, adding to the effi- ciency of this approach. Standard KME CNC tombstones, which are offered only in a two-sided model at this time, are equipped with four platters on one side or two platters on both sides. Custom configurations can be arranged for as many as four platters on each side. The indexing platters extend only a couple inches from the face of the tombstone, taking up less space within the HMC's workzone than surface-mounted units. The servomotors, circuit boards and all power and signal cables are safely housed within the hollow interior of the tomb- stone. Parts less than 7 inches wide are said to be ideal for the spacing of the platters. 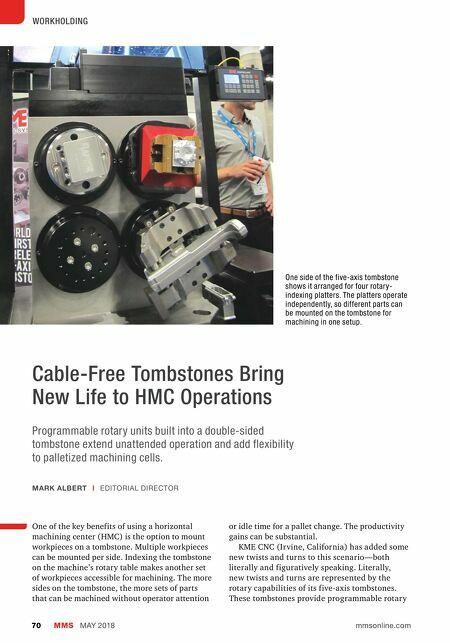 Figuratively speaking, other features add new "twists and turns" to using tombstones on an HMC as well. Specifically, the tombstones oper- ate without electrical cables or communication wires. A rechargeable powercell that slides on and off the top of the tombstone provides the electrical energy to run all the rotary platters. The tombstone needs no connection to the power supply of the host HMC. Meanwhile, a radio frequency (RF) receiver within the tomb- stone provides the digital connection to a trans- mitter connected to the machine's CNC. The tombstone needs no other networking or wiring to receive signals from the CNC to control the ser vo drives on each platter. Because the tomb- stones do not have exterior cables or wires, they are free to shuttle in and out on a pallet system. A part 7 inches wide or smaller can be accommodated on each platter. Platters extend only a couple inches from the face of the tombstone to free up space in the HMC's workzone.